The last reach of the day; the last reach of summer. A beautiful evening at the lake and breezy enough for a light sail. I did feel a little bit like a tourist painting the lake, but the sculptural forms of the mountains are so interesting to me in the last light of the day. I wish there had been some clouds to break up the uniformity of the sky, but this way the slight shadow of the mountain on the atmosphere was visible. Study 12x7", Oil on Linen. I love the way you've been building your composition around mountains in your last few blog posts. You've done it in a way that keeps the scenes tranquil, yet quite majestic at the same time. 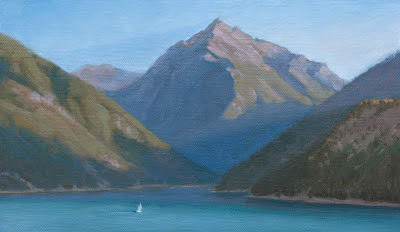 The fact that you painted this particular piece around a lake has made me feel guilty that I didn't have a shot at painting the landscape the last time I spent a weekend at a lake :P.
But speaking of these "mountain paintings"; I'm curious as to how you've been going about your choice of composition? Have you just been picking the largest, most dominant mountain that juts out over the landscape? Or have you been picking the ones that are the most visually interesting? Such as the way they appear when the light hits them in a certain way, or how their coloration changes during particular times of day? Or how their features contrast according to the lighting conditions? Thank you! I wish I spent more time choosing what I was going to paint, often it is a bit of a last minute rush. But I usually am attracted to shapes and structures that have strong light/shadow interplay. The trickiest part is that these light/shadow patterns only last about 5 minutes, so I paint them very thinly since I don't have a lot of time to build up any paint. The mountains I have been painting in general are not the biggest or most dominant because they tend to be more difficult to compose around. A mountain peak is a difficult subject to compose with anyway, which is one reason they tend to look better with a bit of a cloud covering them. But, when I'm doing studies, I try to paint what I see because I'm mostly doing them as seeing exercises. We are supposed to be getting some clouds in this week, so maybe I'll get a chance to do something more interesting with the mountains.